Walter Bridge is an ambitious lawyer who redoubles his efforts and time at the office whenever he senses that his family needs something, even when what they need is more of him and less of his money. Affluence, material assets, and comforts create a cocoon of community respectability that cloaks the void within—not the skeleton in the closet but a black hole swallowing the whole household. 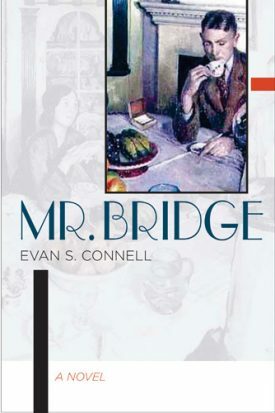 Mr. Bridge is the companion volume to Mrs. Bridge told through a very different voice. The Bridge novels have been recognized as classics during their author’s lifetime. With their shared ability to capture the manners and mores of the American upper middle class, best-selling author Evan S. Connell has done for the late thirties what Sinclair Lewis did for the twenties. EVAN S. CONNELL, long recognized as one of the most important literary voices of contemporary letters, is the author of 17 books, including Mrs. Bridge and Deus lo Volt, and the best-selling Son of the Morning Star. He passed away on January 10, 2013.